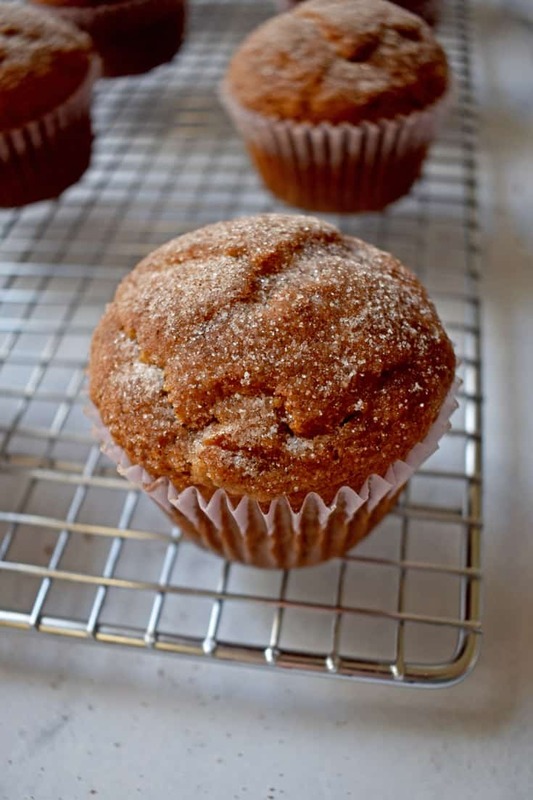 Gluten Free Cinnamon Banana Muffins have a tasty cinnamon-sugar topping. 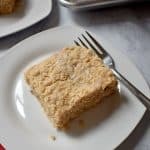 They’re perfect when you want a simple breakfast treat or afternoon snack. I’ve mentioned before how busy mornings are, in our house, during the work week. There’s little time for breakfast so something quick and easy is a must. Usually, I find myself baking batches of muffins on the weekend when I have more time. Then I pop them in the freezer to be enjoyed throughout the week. Gluten Free Cinnamon Banana Muffins were part of my latest weekend baking fest. They’re super easy to make and freeze really well – both great qualities in my book! 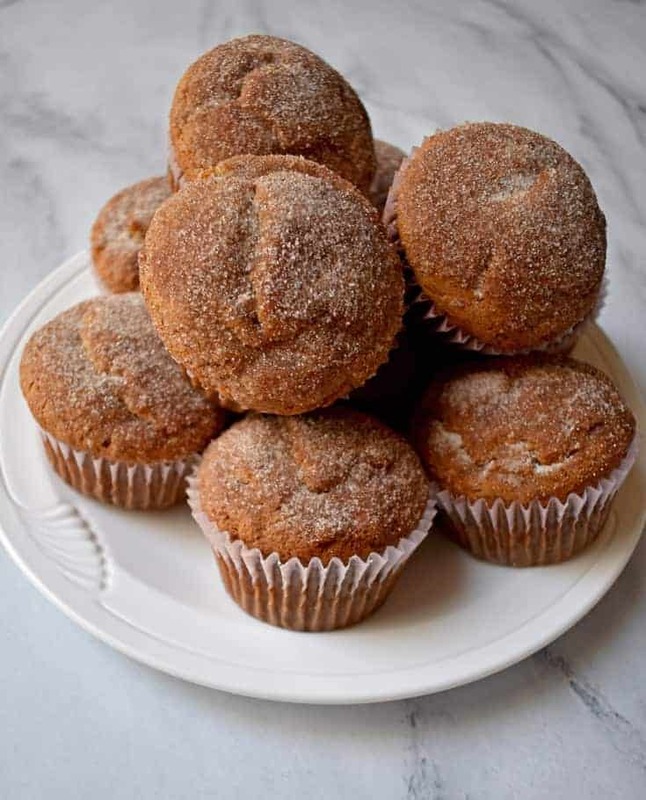 Although these cinnamon banana muffins have a cinnamon-sugar topping, they’re not very sweet. If you prefer a sweeter muffin, you’ll want to try my Triple Berry Gluten Free Muffins or Gluten Free Chocolate Chip Banana Muffins. If you’ve mixed up standard muffins before, this recipe is very similar. All you need is a medium mixing bowl, wire whisk, wooden mixing spoon, and measuring cups and spoons. Start by preheating the oven to 375-degrees and line your regular-size muffin pan with 12 baking cups. If you don’t have baking cups, you can grease the bottoms of the muffin cups instead. I like using baking cups because they make the muffins more portable and reduce the clean-up time. Place the 2/3 cup sugar, oil and eggs in a medium mixing bowl and whisk together with a wire whisk. Add in the mashed bananas and vanilla, and stir with a wooden mixing spoon until combined. 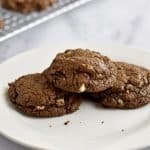 Add in the gluten free flour, xanthan gum, baking soda, salt, and 1/2 teaspoon cinnamon and stir until everything is combined. 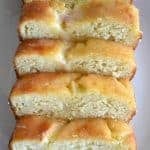 Divide the batter between the muffin cups and bake for about 18 minutes. 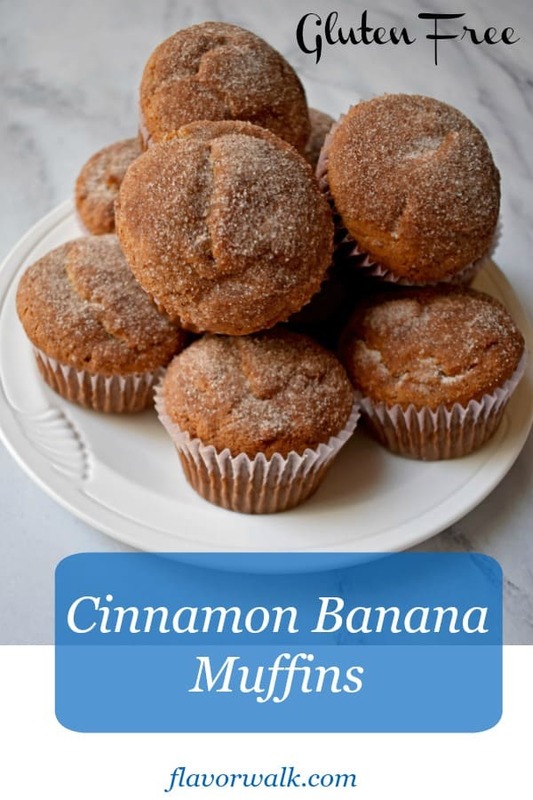 Test the cinnamon banana muffins for doneness by inserting a wooden pick into the center of a muffin. If the wooden pick comes out clean, the muffins are done. Remove the muffins from the pan and place on a wire rack to cool. While the muffins are cooling, melt the 1/4 cup of butter in a saucepan on the stove top. 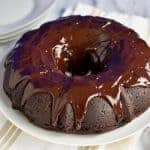 Combine the 1/4 cup sugar and 1/2 teaspoon ground cinnamon in a small bowl and stir together. Brush the melted butter on the tops of the muffins with a pastry brush. 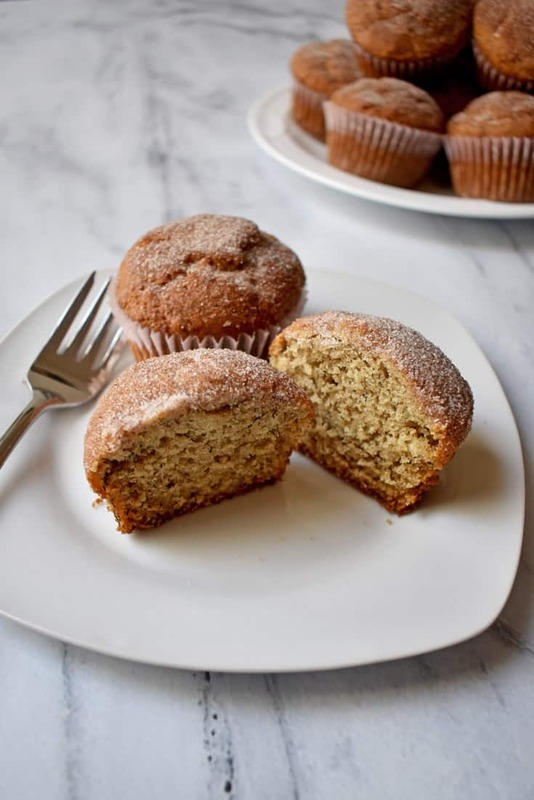 Using a large tablespoon, sprinkle the cinnamon-sugar mixture over the buttered muffin tops. When adding the dry ingredients to the wet ingredients, be careful not to overmix the batter. Overmixing will lead to muffins that are tough. Test the muffins for doneness at about 16 minutes. Oven temperatures can vary and while I bake the muffins for 18 minutes, you may need more or less baking time. Using a pastry brush to brush the melted butter on the tops of the muffins allows for even coverage without much mess. If you freeze the muffins, they will thaw overnight in the fridge. 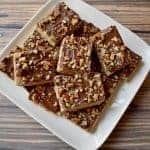 In the morning, simply warm them up for about 30 seconds in the microwave. 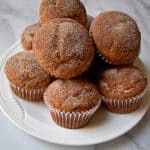 Jim and I enjoy these cinnamon banana muffins with a hard-boiled egg (made on Sunday evening) or fresh fruit. Having an egg with the muffin gives us a little protein with the carbs. 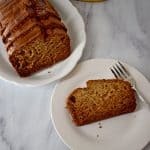 If your week day mornings are as busy as ours, try whipping up a batch of Gluten Free Cinnamon Banana Muffins on the weekend and enjoy them all week long! 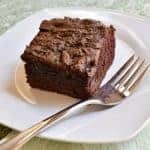 LOOKING FOR MORE GLUTEN FREE MUFFIN RECIPES? 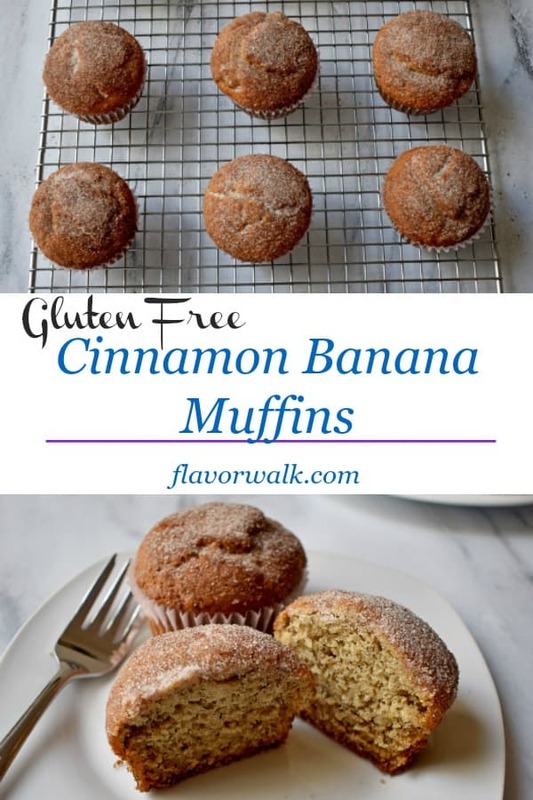 Gluten Free Cinnamon Banana Muffins are perfect when you want a simple breakfast treat or afternoon snack! Preheat oven to 375 degrees and line muffin pan with paper baking cups. In medium bowl, whisk together 2/3 cup sugar, oil and eggs until combined. Add mashed bananas and vanilla and stir together. Add in remaining muffin ingredients and stir until just combined. Be careful not to overmix the batter. Divide the batter among the baking cups. Bake 18 minutes or until wooden pick inserted in center comes out clean. Remove muffins from pan and allow to cool on wire rack. For topping: Stir 1/4 cup sugar and 1/2 teaspoon cinnamon togethr in small bowl. With a pastry brush, brush the muffins tops with the melted butter. 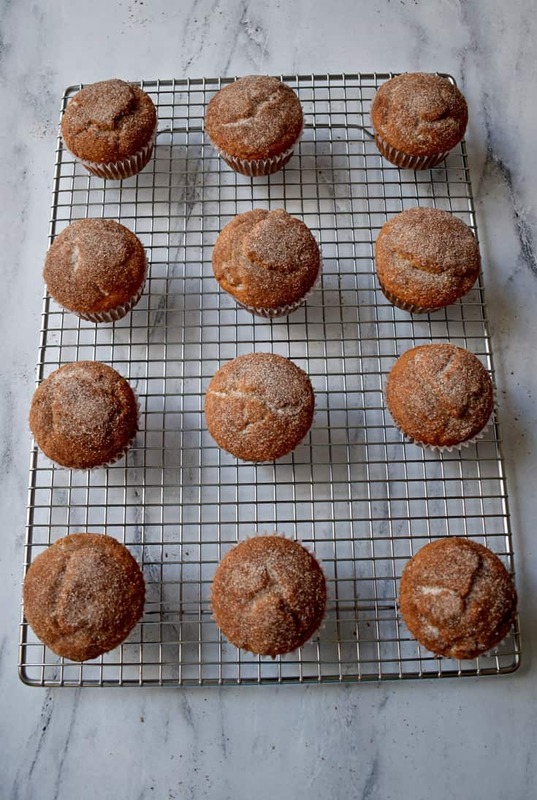 Using a tablespoon, sprinkle the cinnamon-sugar mixture over the tops of the muffins. When adding the dry ingredients to the wet ingredients, be careful not to overmix the batter. Test the muffins for doneness at 16 minutes. Oven temperatures vary and you may need less baking time. Use a pastry brush to brush the melted butter on the muffin tops for even coverage. These muffins are moist and delicious. 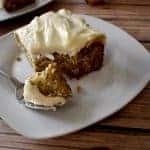 A great way to use bananas that are a little over ripe. 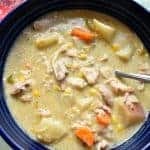 I always love finding new recipes to use up bananas!